Offering you a complete choice of products which include Renault Duster Car, Renault Pulses Car, Renault Koleos Car, Renault Fluence Car, Renault Scala Car and Duster. We've combined design and performance to bring you the Renault Pulse. Zigzag your way through the city in style. Encounter the Renault Koleos. With its elegant lines and ruggedness, it is definitely a showstopper. 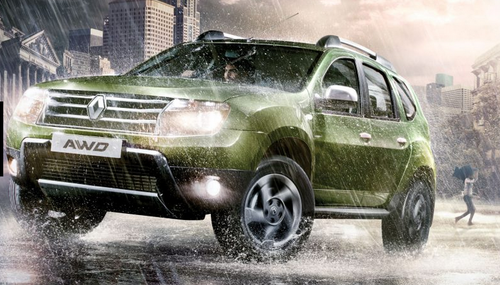 The Renault Duster embodies a bold, sporty and masculine character. Navigating rough terrain? Rediscover the pleasure of effortless driving with the new Renault Duster. Renault engineers' prime concern is your safety. And we never use it as an excuse to compromise on your comfort. Chrome finishings and two-tone bumpers combine luxury and dynamism. You are sure to make heads turn in the Renault Scala. Have a smooth drive in the spacious cabin of Renault Scala. Drive in complete safety. The Renault Scala's Anti-lock Braking System and Electronic Brake Force Distribution look out for you. Discover the athletic and dynamic styling of the Renault Pulse. Come aboard the Renault Pulse and enjoy its comfortable and spacious interior. Expect zippy performance, low CO2 emissions and very reasonable maintenance. Make heads turn in your Renault Koleos with its inimitable design and bold features. Enter the Renault Koleos. Its top-of-the-range upholstery and modular design gives you plenty of room and keeps you zen. Get an inside look at the top-of-the-line safety features that make Renault Koleos a high-level performance vehicle that guards you on the road. Chrome finishing and two-tone bumpers combine luxury and dynamism. You are sure to make heads turn in the Renault Scala. Have a smooth drive in the spacious cabin of Renault Scala.Drive in complete safety. The Renault Scala's Anti-lock Braking System and Electronic Brake Force Distribution look out for you. By: Kusalava Motors Pvt. Ltd.